Happy Australia Day one and all! Now you might predict I'd be making a typically Australian dessert or sweet on this day, but I've decided to go with a take on a take of the Australian Lamington. If you aren't familiar with the lamington, you're seriously missing out. It's a rectangle finger of sponge cake enveloped in chocolate and sprinkled with coconut. Sometimes they're even filled with creamy goodness, and on occasion, jam. Recently I saw a spin on lamingtons in the form of jelly cakes. Jelly cakes are fantastic. They're a staple at every kid's party and a bit like a lamington, except without the chocolate. The cake is dipped in liquid jelly mix and immediately rolled in coconut. So here's a spin on that, perfect food for a little girls (or big girl's) party. 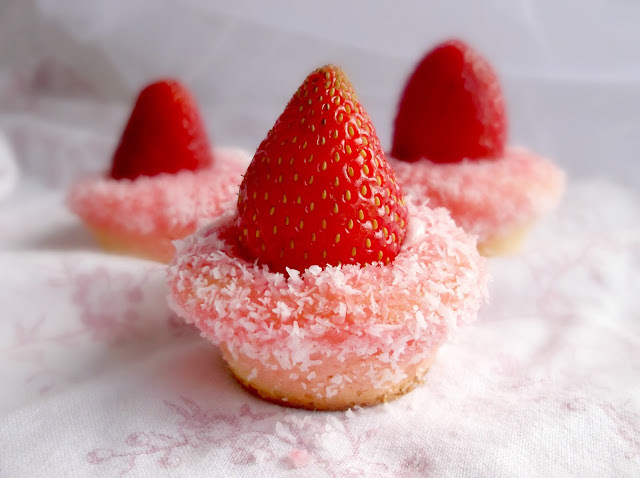 They look so quaint and pretty in all their pink glory, made deliciously moist with the addition of the jelly, and topped with a dollop of butter cream icing and a giant strawberry. They couldn't get much cuter! Make the buttercake batter as directed on the box, and divide the mixture in half. In one half add a capfull of red or pink food colouring and mix well until incorporated. Alternately spoon the two colours of batter into cupcake tray holes, layering the two colours to achieve a two tone cupcake. Use all the mixture in this manner and bake as directed on the box. 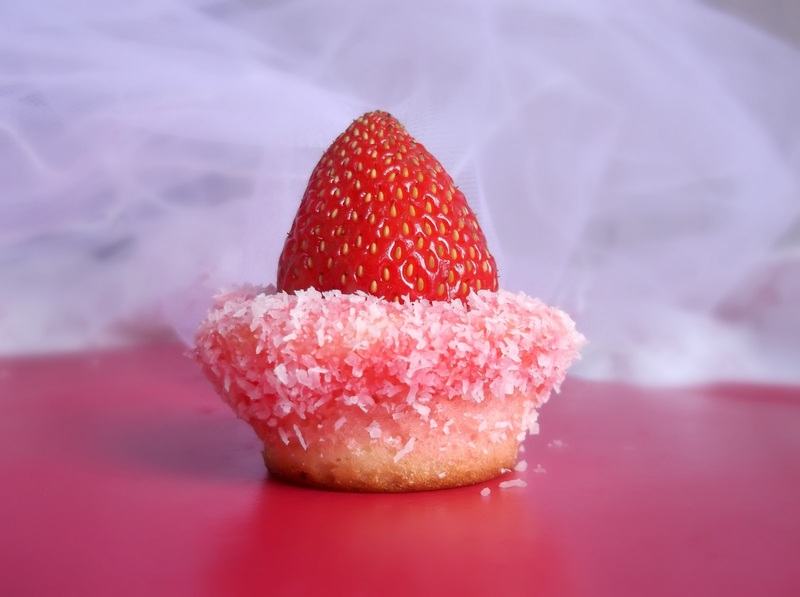 When the cupcakes are cooked and cooled, cut out the centre of each to form a well. Do not cut to the bottom of the cupcakes. Aim for a 20c piece size as a top view, big enough to sit the bottom of a strawberry in. Make the jelly as directed on the box. 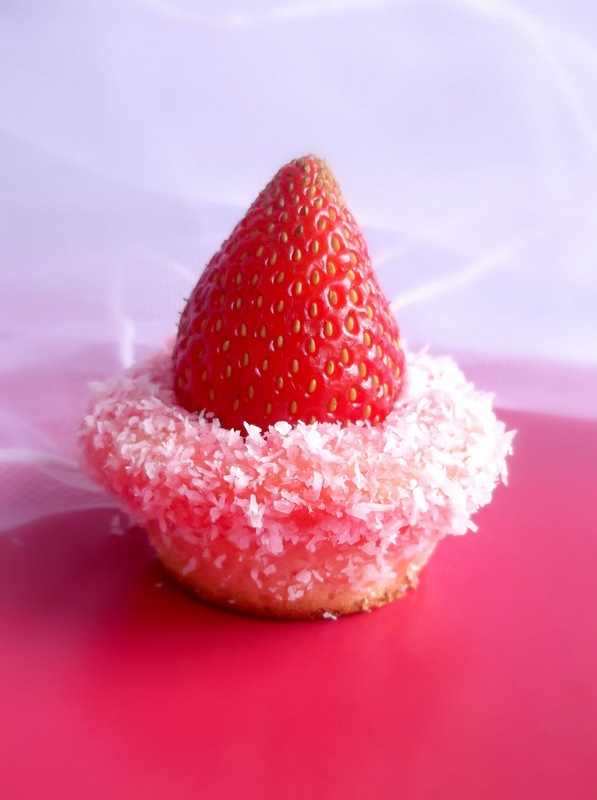 While still warm, dip the top of each cupcake briefly in the unset jelly mixture and then in coconut. Fill the wells with a dollop of whipped cream. Cut the leaves off the strawberries. Position one strawberry ontop of each dollop. Serve. hello! i havnt tried making them without coconut but you could try white chocolate shaving instead, perhaps? What are jelly crystals and where would you buy them in upstate NY ???? I believe Jelly crystals would just refer to Jello in the US. yes I believe youre right!